Come support Boston’s young entrepreneurs by visiting one of their lemonade stands around Boston. 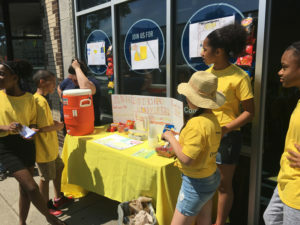 Lemonade Day Boston is powered by NEBiP and sponsored by Eastern Bank, United Way of Massachusetts Bay Merrimack Valley, Boston Public Schools and others who are passionate about teaching our youth about the skills necessary to run a business and give back to our community. Lemonade Day in Boston is on June 2nd (updated due to expected rain on May 19th). Its mission is to teach youth the entrepreneurial skills necessary to start a business and, in the process, learn valuable life skills including philanthropy. This year, a selected group of enthusiastic Boston Public School students in grades K-8 pursued a 6+hour curriculum aligned with standard requirements, including math, financial literacy, social skills and leadership. The program also emphasizes civic leadership and individual empowerment. More than 400 young entrepreneurs participated this year and will be selling their product on Lemonade Day. A portion of the proceeds will be donated to community organizations selected by the individual classrooms. – Eastern Bank Coolidge Corner, 301 Harvard Ave.
We welcome your questions and encourage you to contact Bithiah Carter bcarter@nebip.org to learn how you can support our young entrepreneurs.